Second Monday in October is the annual tup sale for the North of England branch of Blackfaced sheep - the Hexham type. 10th October 2011 was the date and Shep mozzied along. There were a good show of tups on view, definitely more showing scotch bloodlines but the traditional Hexham type were also abundant. Trade seemed good throughout although you wouldn't have to break the bank to get a half useful hill tup. 2011 saw all records broken. 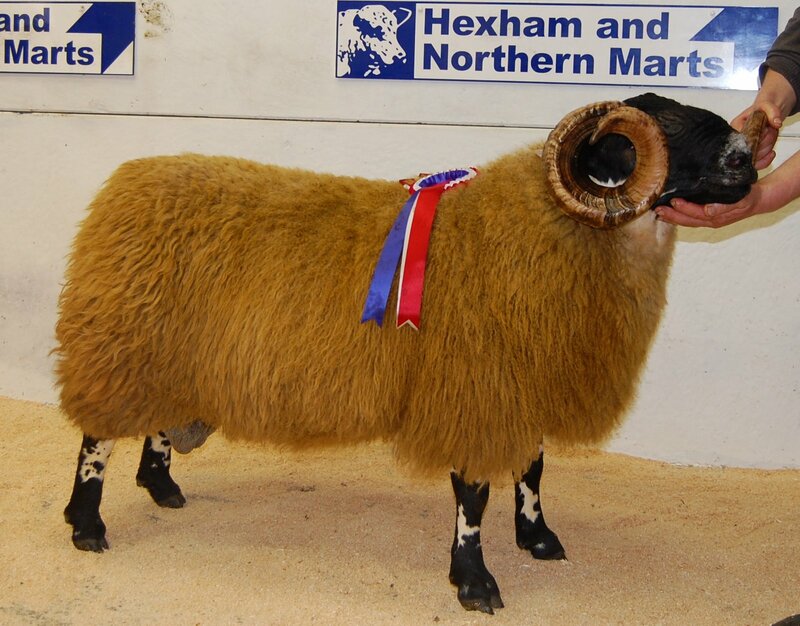 A new breed record for Hexham Auction Mart was realised with the first prize shearling from Toft House. Robert Robson, shepherd, from Toft House managed not only to win the shearling class which was judged earlier in the morning, he also won the best group of three shearlings, followed by taking the overall championship. Three lots of silverware awarded to him in the ring prior to the sheep being sold, followed by the fourth cup awarded to the shepherd of the champion sheep. At the end of the sale he would also be awarded a fifth cup for the sheep which made the most money on the day. £20,000 was the magical figure. I don't know for sure but I can't recall one farm managing to take as much silverware away in one go, a credit to the man himself and his sheep, let alone the new centre record of £20,000 paid by Robbie and Paul Coulson of High Staward. Now I bet you're all looking forward to seeing a picture of this magical beast - so am I, there has been much blaspeming and cursing this evening but all to no avail. I cannot retrieve the photos - aargh! That nifty little pocket camera I invested in after lambing time has been getting well and truly cursed, there would now appear to be a fault on the card. A last ditch attempt will be to send the card to a friend who knows more about computers and digital things than I do - my fingers are crossed! Needless to say, the sheep in question was a fine example. Finally - a photo, taken off the mart website. At least any one viewing this post can see what the £20,000 sheep looked like. Shep had an enjoyable day, catching up with friends, catching up with crack and thoroughly enjoying the company of a sound sheep man, a retired shepherd in his 80's from the scotch side who transformed every sheep which entered the ring with his knowleadgeable eye. The proceedings were unfortunately cut short with a pending dentist appointment, must remember to get an earlier appointment next year! On the way home I called to visit an amazing gentleman who is closer to 100 years old than he is to 90. I will write a post about this some time soon, for now I will just say it was a cracking way to round off the day, especially as when I finally trundled up at home the other half had managed to make our supper! My ganderings are coming to a halt, I did have an invitation to attend St Johns Chapel to view the Swaledale tup sale tomorrow but unfortunately work has to come first, I may get to Lanark on Thursday but then I may not........ I am absolutely gutted I didn't get away to Dalmally tup sale on Saturday past, however, life is too short and the date is booked for next year, come hail or high water nothing will stop me from heading away up into Scotland to view the tups at Dalmally, it is one of those MUST DO's in life and next year I WILL DO !